You’re excited and anxiously waiting for us to ship you your 2017 Ministry Meeting Workbook companion, aren’t you? Would you like a “behind the scenes” look at how we are making them right now? 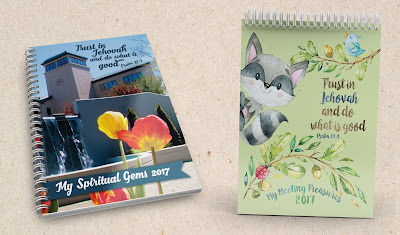 The yeartext for 2017 was announced at the Annual Meeting of Jehovah’s Witnesses on Saturday, October 1st this year. It will be: “Trust in Jehovah and do what is good” - Psalm 37:3. Isn’t that a beautiful text? As soon as we learned the yeartext, we started work. 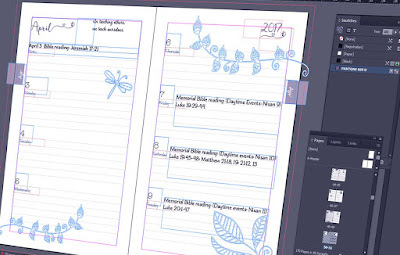 Furthermore, the Bible reading for 2017 came out as part of the “Examining the Scriptures Daily” booklet, which was released on jw.org on Tuesday, October 11th. the design work and looks after her three children. Tim, a brother in Ontario, Canada next helps with the proofreading. He used to work at the Canada branch of Jehovah’s Witnesses and has recently been reassigned as a special pioneer. He has a great eye for catching even minor misteaks. (Oops! There we go again!) His occasional work for us helps out a little to supplement his special pioneering allowance. 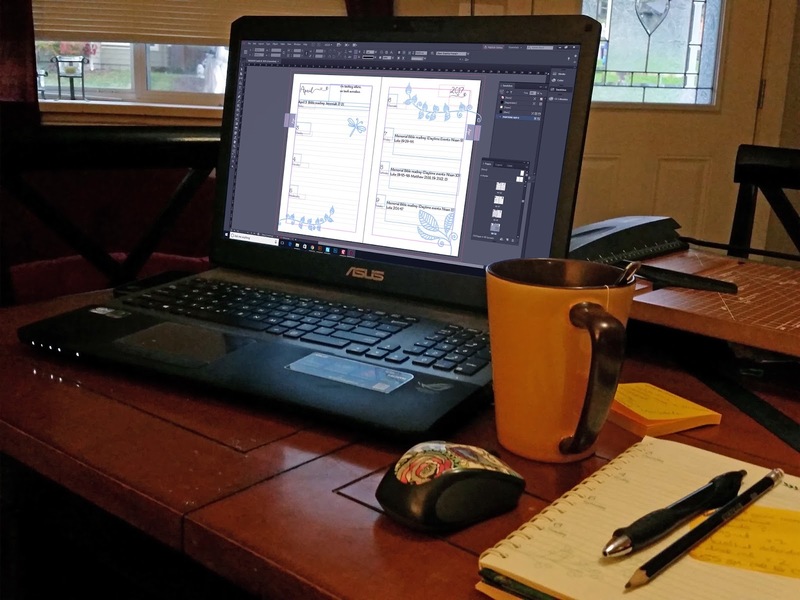 The artwork has to be approved, and then the printing can start. First of all, the artwork and text are separated electronically into four different colors: Cyan (light blue), Magenta (similar to pink), Yellow, and Black. Each of these color separations gets transferred to a printing plate. 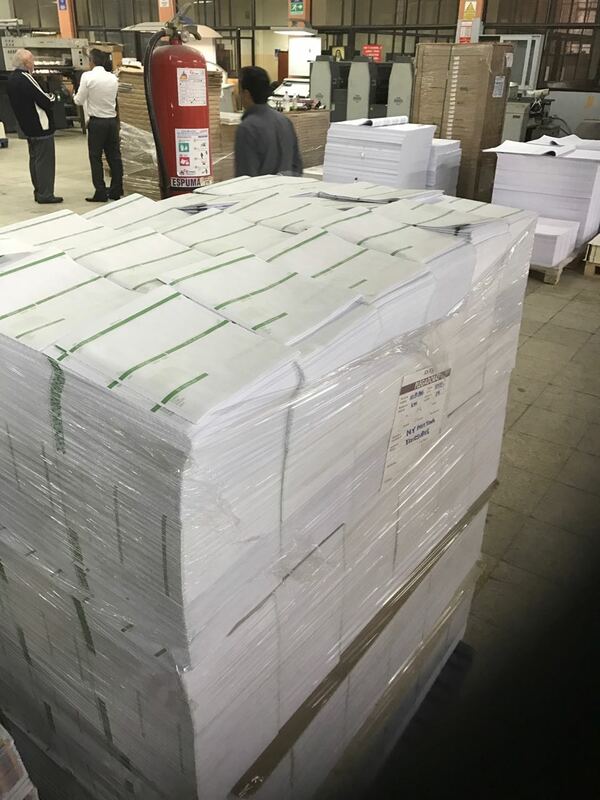 Finally, the printing press is prepared. 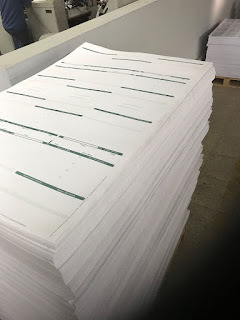 The print shop prints the text of our notebooks on large sheets of paper, as illustrated below. 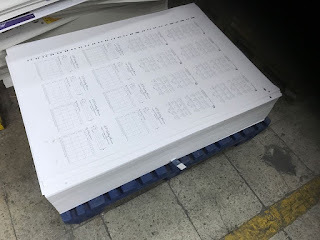 Working with large volumes of paper allows us to lower costs and produce our calendars and notebooks more efficiently. We use an offset printing press, into which the large sheets get fed through automatically, one at a time. 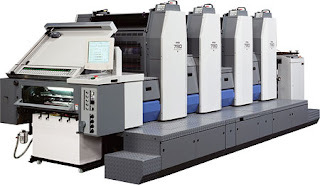 Offset printing transfers ink from the printing plate onto the paper, but instead of the plate pressing directly against the paper, there is an extra step involved. The inked plate presses onto a soft roller, transferring the printed image onto the roller. Then the roller presses against the printing surface. 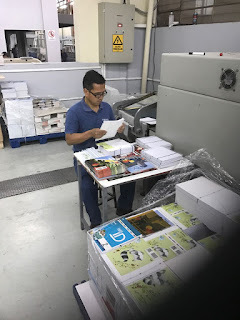 So instead of the press directly printing onto the paper, the printed image is first offset to the roller and only then transferred to the paper, preventing the printing plate from wearing out. By using this process, we are able to produce consistently higher quality products. For the full-color portions of our products, the whole process happens four times, once for each of the four colors. Next, after the sheets are printed and dry, they need to be bound. The large sheets are cut into smaller pages that are still about twice the size of a finished book. The smaller pages are then divided into small groups, folded in half, and collated. We manually bind each notebook with metal coils. Although coil-bound notebooks are much more labor-intensive, we believe they are easier to use at the meetings. Finally, the pocket for your 4-page Ministry Meeting workbook is manually folded and glued into the back cover. It takes a LOT of work! To ensure that we produce a quality product, the print shop must conduct many periodic checks. 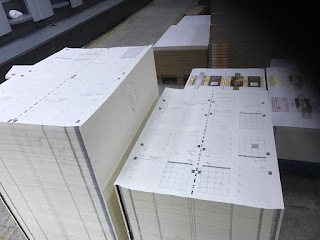 In addition to reviewing blueprints for accuracy, the printer will pull a press “proof” or sample, before the print run begins. If parts of the proof are too light or too dark, adjustments to the press may be required. 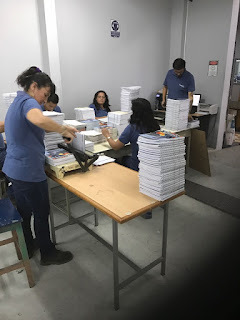 After the notebook signatures are collated and bound together, the print shop will spot-check them to make sure they have been folded and bound correctly. Some of the instruments used to control quality include densitometers and colorimeters, both of which are used to evaluate the color; paper hygroscopes, which measure the moisture balance of the paper against the relative humidity of the printing room; and inkometers, which gauge the quality of the ink to be used. 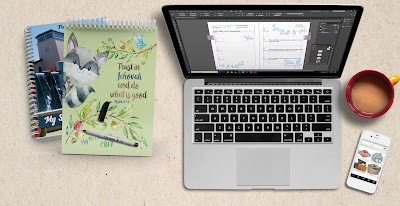 Have you purchased our notebooks in the past? Please let us know what you thought about them in the comments below! Here is some GREAT feedback that we received from last years’ notebooks. Thanks, guys! We just received our order. I was so very happy to find a pocket in the back for the new meeting workbook. It fits nicely in the back pocket. I'm sending a picture. Thank you so very much for that feature. I'm old school and do not have a tablet. Love love love the notebook I ordered as companion to he new JW workbook. High quality, beautiful graphics, thoughtful product design. It is perfect! Thank you Brothers and Sisters! Thank you for sharing this! It is wonderful to see how things get made behind the scenes and to hear about some of our Brothers and Sisters working to make the products! The behind the scenes of how your products are made was really cool! I was wondering how you pick the illustrations of some of the paper products and if you needed any more illustrators to help.